Whenever my husband (the secret chef) requests cajun night, I use my cajun spice mix. Tonight it’s tempeh with my clean version of dirty rice and a side of steamed spinach. Thinly slice the tempeh. Whisk the marinade ingredients together. 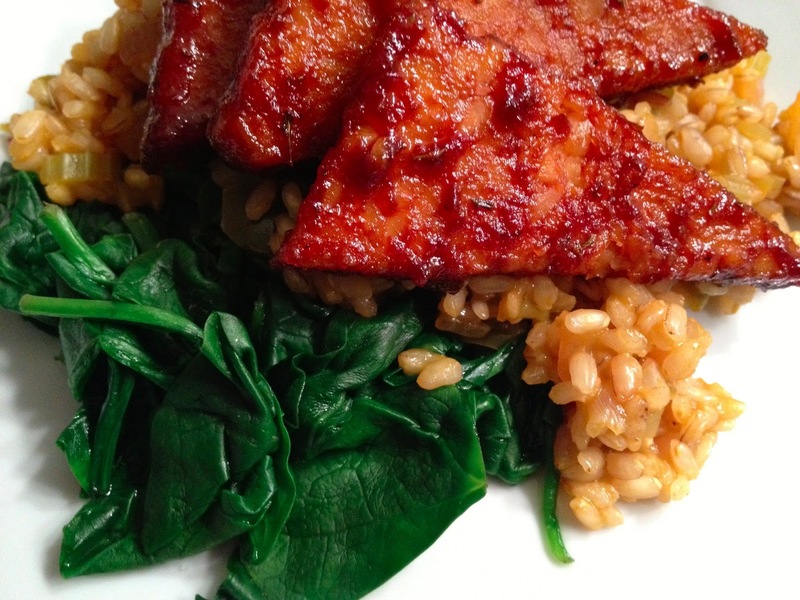 Pour tempeh and marinade into a non-stick skillet and cook until bubbly and caramelized. There will be some marinade left in the pan. Spoon it on top of the tempeh and rice! Dice the vegetables. Sauté in a drop of oil for a few minutes, until they start to soften. Add the rice and stir around. Add the stock, paprika, salt and pepper and cook until liquid is absorbed. Steam a handful of spinach. Plate it up and enjoy!